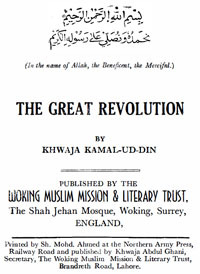 In this book, Khwaja Kamal-ud-Din contrasts the revolution wrought by Islam with all its rationalism towards and understanding of Science versus the desperate want that Christianity and Hinduism are left in on this topic. The present Revolution though sudden and far-reaching in its consequences, is only the completion of that inaugurated by Islam thirteen and a half centuries ago. Islam introduced radical changes into every department of human thought, nay, it changed the very conception of religion, bringing, as it did, within its scope everything of any importance in life. It created a strong sense of monotheism, — in itself, no doubt, an ancient institution, but destined, nevertheless, to cause many a revolution in other branches of human society. It introduced democracy and the equality of mankind. It raised the status of women, and laid down principles, which were, in the long run, to abolish slavery, it sanctified labour and spoke strongly against usury — the root cause of capitalism and aristocracy. It made Nature subordinate to Man, and exposed the errors which had, aforetime, induced men to worship Nature in the guise of gods and goddesses. It encouraged new learning which reduced every component of the universe to the service of man, thus opening the door to material progress and giving an impetus to science, a thing unknown before Islam. Ignorance fought with Islam for the maintenance of old institutions, and though most of the reformations were accomplished within three centuries of the delivery of the Prophet’s message, the fight continued until the beginning of the present century when these reformations were brought to perfection. Events had begun to follow each other with greater rapidity, and in the beginning of the twentieth century they were strung as close as beads of a rosary. So it had been prophesied by the Holy Prophet Muhammad when he predicted a time which would bring Islam into prominence. Imperialism, aristocracy, capitalism and the Western Church were at the height of their ascendancy in the last century, and it was the Great War which sounded the death-knell of most of the ancient things. These four institutions collapsed, giving way to absolute Democracy, sometimes identified with Labour. But the most wonderful change occurred in the sphere of religion. Religion had been losing ground before the onslaught of Freethought and Atheism. Though the Church Christianity was destroyed, more or less, in this conflagration, and the institution of the Sabbath, albeit of long standing, lost its sanctity, religion, in general, emerged unscathed from the ordeal. Nay, rather it seemed to have acquired new vigour. Science, though one of the principal adversaries of Christianity, was found to uphold belief in God. It established such belief on an intelligent basis, but the God of Science was not the God of the ancient religions. The scientific world sought to behold Him in His real colours. It strove to find the Deity in the pages of Nature. But a large portion of revealed theology proved to be faulty in this respect. Though men of science were dead against religion, but further research in Nature compelled them to bow down before the God of the Quran for the God of the Quran was the same God as the God of Science. It could not be otherwise. If Science can read the ways of the Lord as He works in Nature, Revelation must also come from the same Source, to teach us how best to utilise the treasures of the universe. Thus, Theology and Science are one and the same thing. There can be no conflict between a true science and a true theology. They must work as comrades to further the cause of humanity. But science was unable to support a dogmatised theology which cannot be confirmed by scientific truths. Science, for instance, saw the principle of Evolution working everywhere. It established that everything in its inception was, perfect. Though it gradually passed through various phases to reach its complete state, it was nevertheless, free from defects. It was, progressive. It could not go back from good to evil. Faced with these truths, it could not believe in human nature — the best handiwork of God — as being sinful or, indeed, anything other than perfect; nor could it lose its perfection by anything which occurred in the Garden of Eden. Again, everything in Nature was capable of observing the Law. Obedience to Law was the rule of Nature everywhere, and, therefore, human nature could not be sinful, seeing that sin consists in our inability to obey the Law. Thus the study of Nature demolished the very basic principle of the Church faith — the inherent sinfulness of our nature. Further observations contradicted the beliefs in the doctrine of Atonement, The scientific mind not only failed to observe any illustration of the Church Scripture in the realm of Nature, but rather saw something directly contrary thereto, which shook the teaching of the Church to its very foundation. This teaching asserted that the mercy of God could not be manifested without receiving some compensation. Hence, the remission of sin (an act of mercy) could not occur until some penalty had been paid in respect of that sin. This led to the doctrine of the Crucifixion. But science saw that God’s mercy and grace had found expression long before man came into existence, demanding no quid pro quo; so the principle of Atonement fell through. In like manner was demolished the Hindu doctrine of Karma. According to Karma or the transmigration of the soul, man is born into this life to reap the fruits of his actions in previous existences. All comfort and happiness in this life are the reward of his past actions. But if we analyse the factors of happiness, we find human actions playing a most insignificant part in comparison with the work of Nature and its contribution to our comfort. The whole of Nature has to work for it; and this was so, aeons before we appeared on the scene. We came to utilise the things already created, which were most decidedly not the result of our own actions. The Quran refers to this phenomenon when it gives the lie to the doctrine under discussion. Again, if progressiveness was observed as a distinctive feature of everything in Nature, why should man alone be retrogressive? His soul could not return again to the worlds he had already known under the principle of Karma. In this respect, the Theosophists would say that if we quit the world, leaving undone things which in the circumstances ought to have been done, we must come back to do them. Science, however, contradicts this argument too. Things in the course of their evolution have passed through various worlds of progress. If they have left any world, bearing with them some deficiency, that deficiency is made up in the coming world. The progressive entity did not revert to the past stage for that necessary rectification. Some children are born with defective organs. These are improved, perhaps, by medical treatment, but the child never returns to the womb for such correction. How wise, then, is the Quran to count in the list of Divine Attributes, Ar-Rahman, — He Whose blessings come to us without reward. We, therefore, need believe neither in the dogma of Atonement nor in that of Karma. Moreover, we find Rabb as God’s first attribute. It means, He Who puts things on a progressive course, from which they cannot turn back. Science has also relieved us of another false conception of theology, which was worked up into a high-flown philosophy in ancient India. It founded various schools of thoughts which are spoken of, even now, with pride by the Hindus, but practically they have been relegated to oblivion, seeing that they not only failed to further the cause of the humanity but retarded material advancement. India in ancient days remained barren of all such progress, and it was not until the coming of Islam that the country caught a glimpse of civilisation, as we understand it today; but the cause of this paucity was no other than the philosophy I have mentioned. Matter and soul were taken as two independent entities, separate from each other in their birth. They were reckoned as eternal as God Himself, and the belief, in the long run, tended to destroy material progress. On the other hand, Islamic science, now reinforced by modern science, took its origin from the principle of the combination of ingredients. This law was discovered to be as ancient in its operation as the Law of Creation itself. In fact, both Laws synchronized with each other. The Holy Book also alludes to certain other principles in the universe working together with the principal of combination. It taught that ingredients of things first originated when various faculties were reposed in them. The said faculties remained in abeyance as long as the ingredients were scattered in space. Though situated far apart from each other, they were within the knowledge of a certain Power that knew also of their whereabouts, and how to exact homage from them. It knew how to combine them, and the proportions in which they had to mix. The Mighty Hand arranged them in their proper order, and then they began to exhibit their inherent properties. They remained, as it were, under keen watch and ward, until they reached perfection. We observe these various operations in Nature, and we follow their example in order to complete our civilisation. It demands on our part, intense conviction as to the existence of these Laws which could not exist if matter was eternal, with no mind in it. Matter may be taken as possessing various properties which may be considered as eternal as itself, but the Laws, under which these properties exhibit themselves, are definitely the qualities of the mind. To begin with, things cannot become combined unless their ingredients come under the operation of a Mind, as I have observed elsewhere. Secondly, things that are eternal are also indestructible, while many of the properties of matter become destroyed in the process of combination. Oil has the property of greasing things, but it disappears absolutely when mixed with alkali; while soap, the produce of a combination, counteracts all the effects of the greasiness. This shows that the properties of things are not eternal. The world thus remained, of necessity, devoid of all progress as long as it believed in the eternity of matter. Let me mention a typical illustration. Civilisation began to work at full strength when the science of chemistry was discovered. This was admittedly the work of the Muslims. They knew that various things in Nature could combine with each other in different proportions and produce new things. They also knew other cognate sciences; but their method of discovery was new and speedy. All scientific researches begin with belief in certain data. Sometimes they are found to be wrong, and the whole process of research came to nothing. It is, in fact, the accuracy of the data that assures progress in science. But the Muslim scientists had no doubt about their success, since they based their data on certain Attributes of God, which gave them a true insight into the Laws working in Nature. For instance, they believed in God being Al-Bari (The Originator), Al-Khaliq (The Combiner of things in given proportions), Ar-Rabb (The Reposer of qualities in things), Al-Wajid (The Finder of things), Al-Jabbar (He Who brings things to act according to His Will), Al-Muhsi (The Estimator), Al-Muqtadir (One Who makes the Law), Al-Hadi (He Who puts things on the right path), and the like. These names refer to the laws upon which the science of chemistry is based. Thus it appears that theology is not simply a mental luxury for the religiously-disposed. True theology in its true form, is the comrade of true science. It brings humanity to advancement. Wrong theology not only maims our faculties but it slams the door on all advancement. No sooner had Islam brought the true theology to man, than he began to progress by leaps and bounds.